by Bill Dwight on Tuesday, March 02, 2010 at 12:49 PM | LEAVE A COMMENT! Are you looking for a sensible allowance strategy to teach your kids the basics of personal finance? Kelly Whalen, a family finance blogger over at The Centsible Life, just covered this very topic in the premiere episode of her new online video show "The Centsible Show". Check out the video replay below to hear her tips and techniques on the topic as well as some Q & A with her listeners. At about the ten minute mark, Kelly also shares her recent experiences with FamZoo. Check it out. 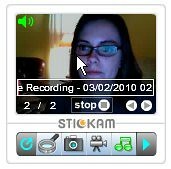 Brief Tutorial:The Stickam video player can be used to watch a collection of videos from a particular show. 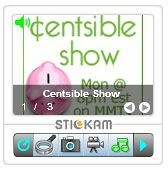 In this case, our player is tuned into Kelly Whalen's Centsible Show. 1. First appearance: When it first appears on your page (which can sometimes take a while), the player will be rotating through still shot previews of each of the videos available for this show. There will also be an extra image for the overall show itself. Don't click on the still images rotating in the player, because you'll be taken off to another window. 2. Show the player menu: Hover over the leftmost circular icon at the bottom of the player, and you'll see the tip "Display Menus" appear. 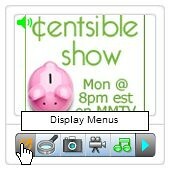 Click on this icon to show a menu in the player. 3. Show the available videos: Move down to the second menu item labeled "View Movies". Click on this item to see the list of available videos. WARNING: don't click on "Open Bigger Screen" - it doesn't work! 4. Launch the desired video: The movies are displayed in reverse chronological order so that the most recent video is at the top. Click on the desired entry (in this case the bottom one to get to the first video in the series) to start playing the video. 5. Show the progress indicator: If you hover over the player, you'll see a progress indicator band that shows the video name, date/time of recording, and current elapsed playing time. The text bounces back and forth so that you can read it all in the small space. 6. Jump to a spot: As the video downloads, a (very) subtle shaded transparent bar grows from left to right in the progress area to show how much has been buffered and a little vertical bar indicates your current position. Click within the shaded bar or drag the indicator bar left or right to jump to a specific spot within the video.